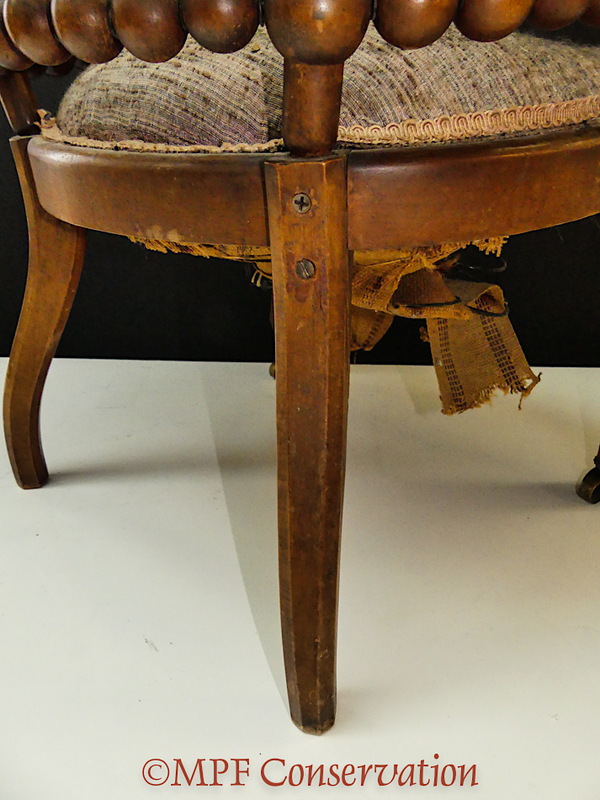 Our armchair, affectionately known as the “lollipop” chair, was made circa 1880. George Jakob Hunzinger (born 1835 in Tuttingen, Germany), was a progressive designer out of New York who was often influenced in his designs by machinery. This is a family piece. as the seat was failing. all four leg stiles, front and back. As always, we begin with a deliberate slow excavation. to everything as you take apart each layer. and the springs are set free to bounce! because it is the least seen and therefore often taken for granted! It’s importance, of course, is the foundation for support and comfort of the sitter, but it is also, from the standpoint of the engineer, the focal point for the distribution of load. their buoyant properties revolutionized upholstery! The introduction of springs to upholstery frames created a stress dynamic which most designers and upholsterers now take for granted, and those stresses from lateral motion of the spring under tension impact the way a frame performs, especially if careful thought has not been taken to include bracing: the frame must withstand the stresses. relative to the actual height of the coil spring. The springs are four times the height of the seat frame! attached between basket woven jute webbing and linen lashing cord. show cover, a woven coral cotton-rayon from the early 20th century. The “second stuffing” (term used in the industry) cotton topper and hair are lifted. The hair is carefully vacuumed through a filter. Most of the fiber will be reused when the re-upholstery is performed. and the fiber pod is carefully set aside for conservation. we find more information about the chair’s history. show at least one previous show cover. which are seen next to the smaller tack, and this is a common mistake. The entire frame is also peppered with too many holes. The last bits, the springs, are dangling from the frame. We measure and set aside. The frame is ready for reparation, next post. 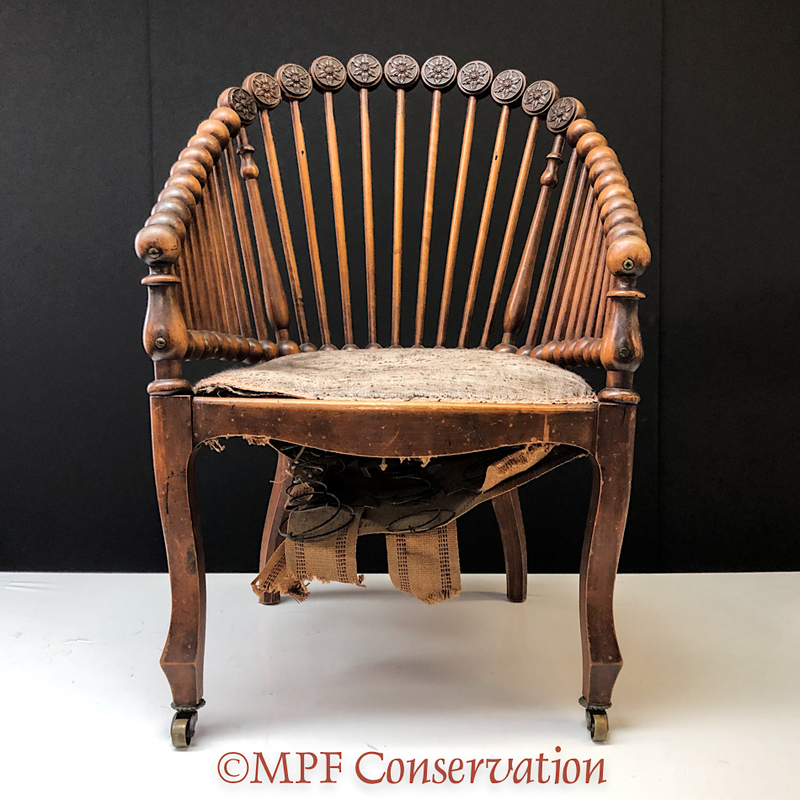 This entry was posted in antiques, art, chair, conservation techniques, decorative motifs, Interim Report, preservation, process, reparation, restoration techniques, upholstery, wooden objects and tagged #americanantiques, #americanfurniture, #GeorgeJakobHunzinger, #Hunzinger, #lollipopchair, #mpfconservation, #nwportland, #objectconservation, #portlandoregon, #spoolchair, object conservation, spool chair, Victorian, Victorian furniture, wooden object conservation. Bookmark the permalink. I always find these reports to be amazing. Great work. I will be concerned about tacking that close to a joint. I’m always impressed by how much information you uncover (no pun intended) as you go. I can imagine DIY types just tearing things off willy nilly. Hi Dan, Sorry about not replying to your reply,I missed this one! I am a novice relative to blogs and it is one of my determinations, this year, to craft regular posts and answer questions and comments as they come. Yes, I too am always concerned when tacking over joinery. This particular chair has mortise and tenons so close to the tacking margins it is almost impossible to not penetrate into some of the joinery. One has to be selective relative to how many tacks or staples. I love these posts (series of posts) and the way you dissect these pieces. I know almost nothing about upholstery. I have a few basic tools, as I was hoping to take on a small footstool project I had seen (I think New Yankee Workshop). Maybe after I retire. If you’re worried about splitting, do you think you have better control over tacks than staples? I would be happy to walk you through a future upholstery project, if you like. Considering today’s communication technology, I think it is very possible to take you through it with ease.Just let me know whenever you wish. There can be advantages with staples in that they make a much smaller punch into the wood, That said, removal of them, depending upon the area amd the wood species can be good or not so good. Tack brands can also be important. Sizes of tack, length and girth are important. Tack manufacturers, unfortunately, do not list girth, so one has to sample the tack to know which works best. I can tell you that a company which is widely distributed in the decorative tack field, Dads, has terrible upholstery tacks. They are powder coated, rater than blued steel, their shanks are way too wide and they are not very sharp. On the other hand Gurney Tacks are decent and more similar to what I saw earlier in my career. My British colleague uses Lion Brand tacks and says that they produce a “bayonet” style tack with is much more thin and sharp. I have yet to try these but think I will order some next time I order from the UK. After four decades in this business i have come to the conclusion that an upholsterer should just get used to tacking margin reparation as part of the actual job. Fact is, any time one removes tacks, or staple, a bit of the surface substrate is damaged and of course we have the ubiquitous holes from the shanks. Upholsterers are afraid to apply the method which I have promoted because it takes so much time. So, they push it down the road for the next “guy” and so on it goes until the frame is depleted and they begin to tack into the decorative surfaces. But I digress! Yes, in may ways I think I do have better control over tacks, rather than staples. Although the tack splits a larger hole than a staple, its removal generally takes less material out of the surface (especially if one is being conscious and skillful while using ripping chisel and mallet). Digging into the surface substrate in order to get under the staple in order to pull can do a great deal of damage.